Norwegian Breakaway is no longer in her infancy but rather is a firmly established ship. Her Hotel Director Prem Kainikkara explained how the ship achieved this in the relatively short space of time since her entry into service in 2013. Breakaway is not uni-dimensional. Within her are several parallel universes, each providing a distinct cruise experience. At the same time, Breakaway also caters to people who are traveling by themselves. Not only does it have cabins designed and priced for single occupancy but it has the Solo Travelers Program designed to enhance these travelers cruise experience. (See separate article). 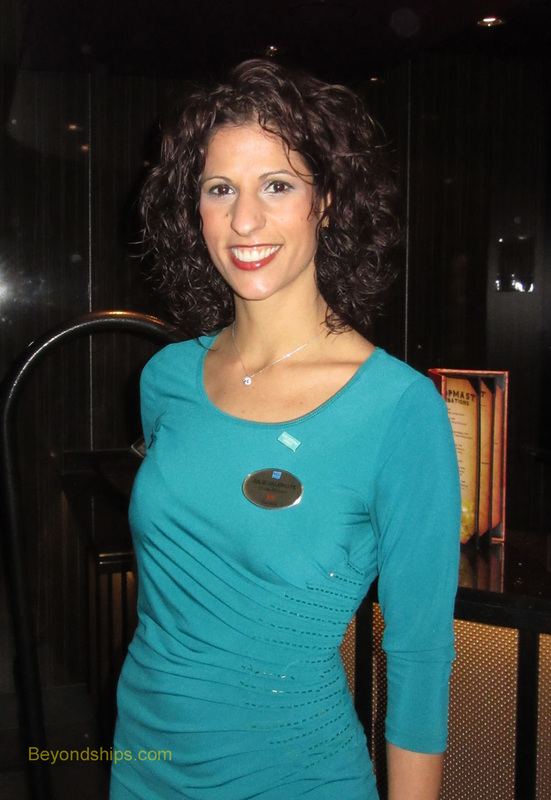 Above: Cruise Director Julie Valeriote. Ms. Valeriote is one of those cruise directors who seem to be everywhere. However, what the public sees is only a small part of what she does: "The guests' perception is that you are hosting, socializing and all of that but that in reality is just a very small part of the job. It is running a business at the same time. It is finding a happy medium between being out there with the guests, having fun interacting with them but also managing a staff of 175 people and all the ever changing behind the scenes that are happening - - dealing with a couple of hundred e-mails in a day, inspections, meetings, fielding phone calls." Being a cruise director also means "finding your own style. Often times people will say this cruise director did this and that cruise director did that. That is great but you have to have your own style, what works for you. It wouldn't be genuine if I was going out there doing one thing versus what I do do." 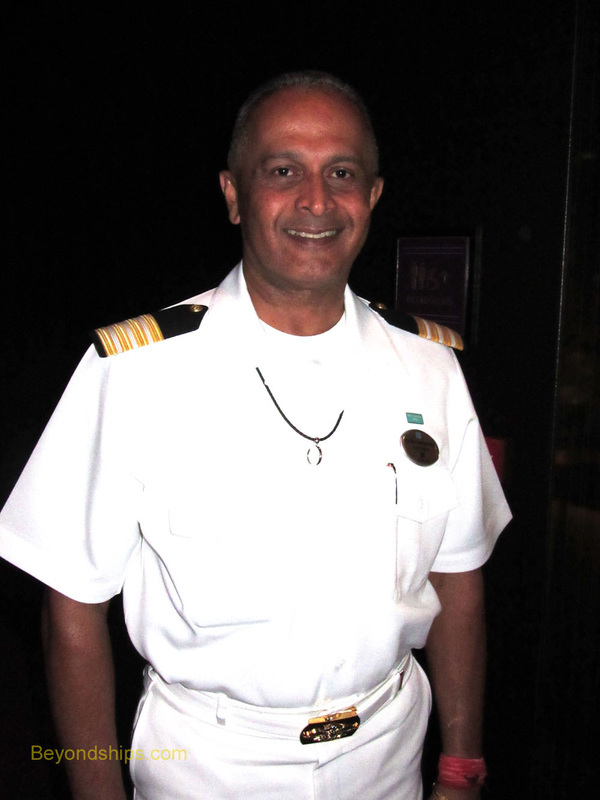 Above: Hotel Director Prem Kainikkara is in charge of the accommodations, entertainment, dining and almost everything else utilized by passengers on Breakaway. He has been with Norwegian since 2007 and his past credentials include managing the line's other New York ship Norwegian Gem. Since she entered service, Breakaway has been based in New York sailing from the historic ocean liner piers on the west side of Manhattan. Ships that are based regionally rather than in one of the cruise capitals such as Miami or Fort Lauderdale, tend to attract a high number of repeat passengers. People who live nearby are attracted to return just because of the convenience. However, if a local ship just offers the same cruise experience over and over, guests will become bored and look elsewhere even if they enjoyed that ship's cruise experience the first time. Ms. Valeriote pointed out three reasons why repeat passengers find Breakaway a fresh experience each time they come aboard. In addition, Breakaway is not static, new ideas and new concepts are added over time. For example, in October 2014, the concept of the Uptown Bar and Grill was radically changed. (See our review). Along the same lines, Norwegian has changed the way Internet service is provided on Breakaway. “We are still testing it out before we roll it to the rest of the fleet. [Service] is not by the minute; instead, it is by the megabyte. For someone who wants to keep connected while cruising, it is a very conducive process. I know members of the crew as well as guests who take a basic package and it lasts forever. If you are doing basic e-mail it is fine. Unlike the minutes program, you paid by the minute whether you used it or not.” The only downside is if you are uploading photos or accessing websites that require a lot of bandwidth, you will use up your plan more quickly. Beyond such conceptual changes, operational changes are an ongoing process. “It is just minor tweaks here and there, not something that you would notice but that this or that is definitely running more efficiently. You learn from experience.” Ms. Valeriote explained.